Wouldn’t it be cool if there really was a pot of gold at the end of a rainbow? And you could hunt it down, like with geotracking or whatever it’s called? A pot of gold. I wonder how much it would be worth? I mean, gold must be worth tons these days. Otherwise why would all those people be having those parties where you rifle through your jewlery box and come away with money, like pirates or something? If I had a pot of gold, I’d buy a new car. Or pay off my house. Or buy a unicorn. Because a unicorn is way more stylish than a Jetta Sportwagon. In silver. Preferably with a sunroof. It’s definitely way more stylish than a Toyota Hylander. I never used to think leprechauns were real. I always just figured they were made up, the stuff of stories and legends. Then I started reading books like Twilight and Sookie Stackhouse. And I learned that not only do vampires exist (although there is some debate over whether they explode in the sunlight or that’s just the glare from their sparkle) but so do werewolves. And dragons. And fairies. Maybe I’ll just buy a lotto ticket instead? Probably better odds. 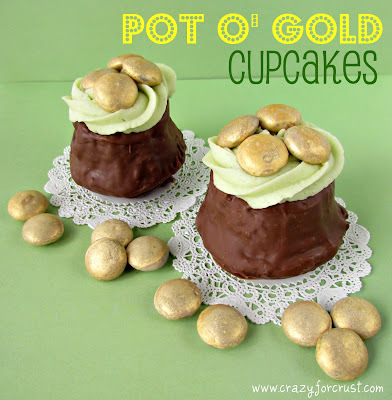 I know pot o’ gold cupcakes aren’t new. They’ve been all over the place, and they are so super cute. But the other day I had some cupcakes. And I had some leftover green buttercream. So what’s a girl to do? I dipped the cupcakes in chocolate, tops and bottoms. You have to let them dry on one side before doing the other. Then I made gold. My own gold. But it won’t buy me a unicorn. It will, however, buy me more time at the gym. 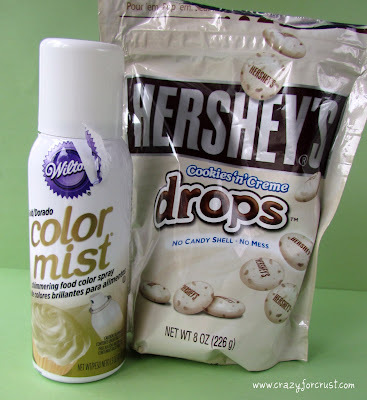 I used gold color mist and Hershey’s Cookies ‘n Creme drops. You can use any sort of candy, like Trish did. And yes, it smells like spray paint. But it’s edible! Then I flipped the cupcake upside down, frosted it, and topped it with gold. Way easier than winning the lotto. Or catching a leprechaun. Melt chocolate according to package directions. I used about 1/2 cup for the two cupcakes. I also added some vegetable oil to thin the chocolate a bit. Dip the bottom half of the unwrapped cupcake in the chocolate, using a spoon to bring it all the way up the sides of the cupcake. 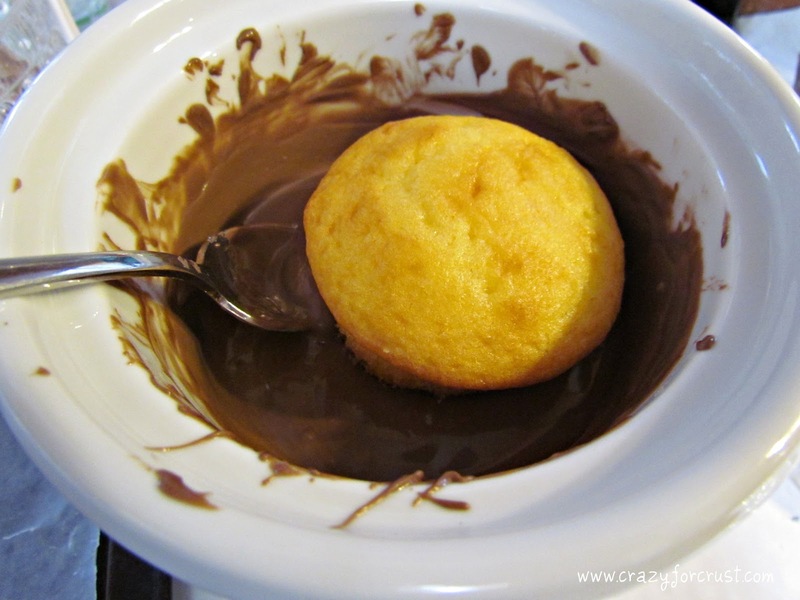 Tap off excess chocolate and place cupcake on a wax paper lined cookie sheet. Let harden (chilling helps speed this step). Dip the top of the cupcake in the melted chocolate, again using the spoon to make sure it is completely covered, no cake showing. Place back on the cookie sheet and let harden. Place as many of the Hershey's Drops on a paper plate as you need. Spray with the gold spray and chill until set. Turn over and repeat, so the entire candy is covered. Turn the cupcake upside down, so the thinner part is on top. Frost with the buttercream (I used a 1M tip). Top with the gold coins. Fool your kids into thinking you really found gold! What would you do with a pot o’ gold? Adorable! You did such a great job on these cupcakes…so clever and cute! My daughter’s kindergarten class baited a Leprechaun trap with “gold” coins just before Spring Break. It will be very interesting to see what they caught! 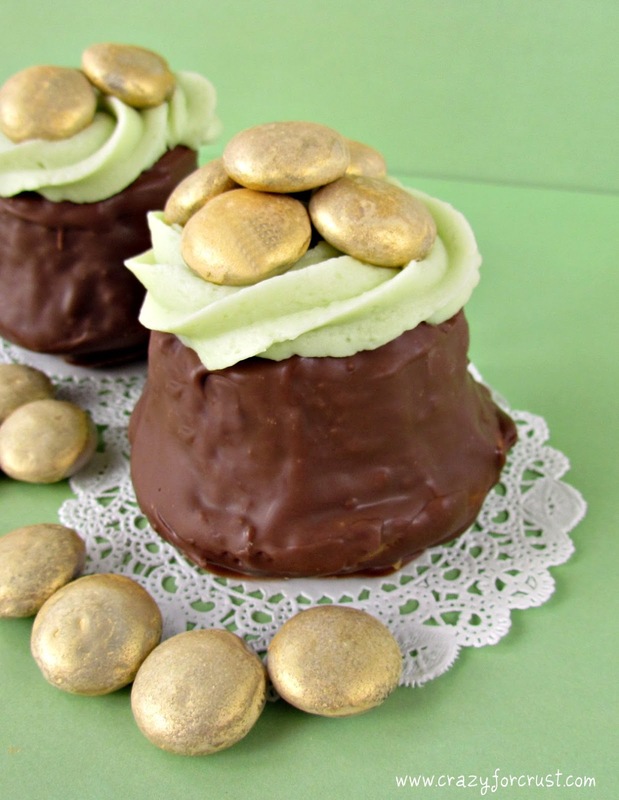 Super, super cute St. Patrick’s Day treats! Thank you! Kindergarten was such a fun leprechaun year. My daughter just built him a house to see if he’d show up tomorrow. We’ll see how tired “he” is tonight! YOU ROCK!!!!! I dream of winning a real pot of gold someday and quitting my day job but these would settle for a decent runner up! Fun (and thanks for the link, how nice of you…) Take care. 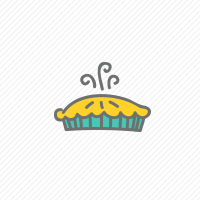 My Friday Food Fight link is up. Come on over and link up a wee bit of your gold. You are full of great ideas, these are exceptionally cute! I hope your St. Pat’s weekend is great! These are cute! And can I ride your unicorn?! I need to get some of that spray paint and make my own gold! 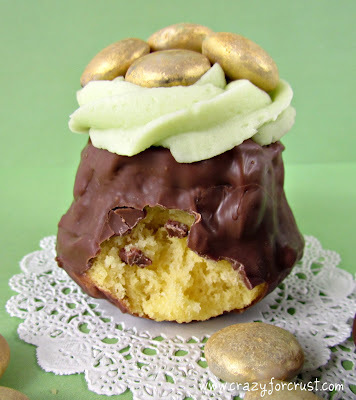 Perfect St. Paddy’s Day treat! Yeah, you guessed it. Pinned! Thanks for sharing!